As there are many paths in the world, so too are there many paths in Tai Chi Chuan. In order to properly understand Tai Chi Chuan one must first perceive it for what it is. Tai Chi Chuan is a tool, a man-made device designed to bring about harmony and balance between energy and mass. Through extension of this balance comes, as the Chinese say, “The Ten Thousand Things“, a euphemism for everything. Because of the vast (and at times paradoxical) amount of physical and philosophical knowledge inherent to Tai Chi Chuan and the very limited time which we will have together, it can be understood that we will only touch upon a fraction of Tai Chi Chuan. Chen and Yang style Tai Chi Chuan forms consists of many movements linked together in a continuous fashion so as to form a single continuous motion from beginning to end or in effect one movement. The exercises are designed to massage internal organs (liver, intestines, stomach, spleen, kidneys, etc.). Also to give flexibility to the spine, create a better sense of balance, stretch tendons and tone muscles in the arms and legs. There is a martial arts aspect involved in Tai Chi Chuan (the name after all means “Grand Ultimate Boxing”). Most of the movements will be described physically in terms of attack and defense for those who are curious about the meaning or reason for particular types of movement. As a final word, let me say that Tai Chi Chuan should be practiced every day, it should not however be something that you have to make yourself do but rather be something that you want and like to do, it should be fun rather than a chore. The most widespread story of the beginning of Tai Chi Chuan is that of Chang San-Feng (1279-1368 AD). The legend states that Chang San-Feng one day heard a noise outside his house, going to his window he observed a snake with raised head, hissing at a crane in a tree. When the bird flew down and attacked with his beak, the snake turned away and attacked the crane’s neck with his tail. Stabbing again and again, the crane was unable to land a solid blow. The snake twisting and dodging was always out of reach. From this Chang San-Feng learned the value of yielding in the face of strength. Studying the movements of the snake and crane, other wild animals and natural phenomena, and taking what he learned, Chang San-Feng devised Tai Chi Chuan. Movements such as Cloud Hands, Snake Creeps Down, and White Crane Flaps Its Wings are vivid examples of nature’s lessons. It is obvious that many years of observation, meditation and transformation were spent by Master Chang San-Feng in giving birth to Tai Chi Chuan. The exact details are unknown, but eventually Tai Chi Chuan was passed to a family named Chen in Honan Province. The Chen clan kept Tai Chi Chuan a secret for fourteen generations. It was forbidden for anyone to teach it outside the family or to teach it to anyone with a bad disposition. Around the end of the eighteenth century, a young man named Yang Lu-Chan, having an active interest in self defense, learned of the Chen clan’s secret. He went to Honan to the house of Chen and sought a job as a servant. Discovering where and when the Chen family practiced, he spied upon them and practiced when he was alone. One night old Master Chen himself discovered Yang Lu-Chan practicing and was so impressed by Yang’s enthusiasm that he broke a four hundred year tradition by accepting Yang as a student. The five primary styles of Tai Chi Chuan are Chen, Yang, Old Wu, Wu, and Sun. 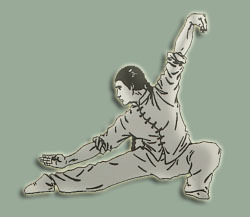 The Chen style is the traditional form from which many other Tai Chi Chuan forms were taken. Tai Chi Chuan went through several alterations as it was passed from master to student. Some alterations were so divergent that they were recognizably different. This is how the Wu Style and Sim Style systems were created. Even with-in the recognizable forms of Tai Chi Chuan, slight differences occurred, which further divided even the five main styles.